Cut the ends off the Zucchini and cut lengthwise. 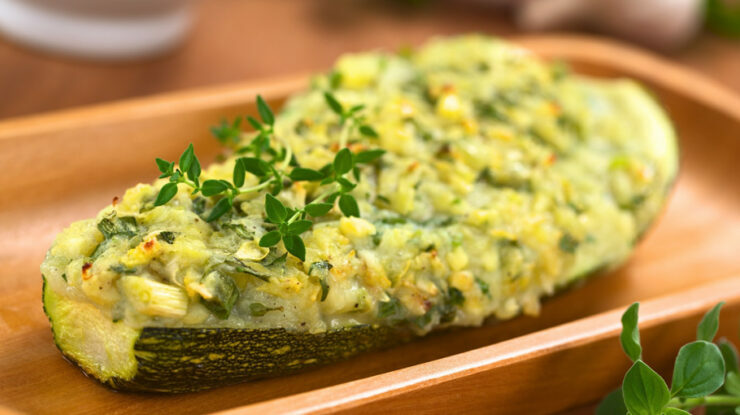 Scoop out the seeds and discard them, making a zucchini canoe. Scoop out some of the pulp and put aside about 8 tablespoons to mix with the cauliflower. Make sure to scoop out enough pulp so you can stuff with the filling. Cut a little piece off the bottom of the zucchini so it can sit flat. Add the 8 tablespoons of the zucchini pulp to the cauliflower. Cook the onion, garlic, kale, and spinach for a few of minutes in a small amount of water or vegetable broth until cooked and combine with the cauliflower and zucchini mixture. Add pink salt and thyme to taste. Scoop mixture into the zucchini canoe and bake at 375 for 25 minutes until the zucchini is tender. Ah, raw cauliflower. Maybe that’s where I went wrong because I didn’t have enough filling for my zucchini boats. I saw “mashed” and assumed you meant steamed and mashed, which would result in less overall cauliflower. I couldn’t imagine mashing raw cauliflower, chopping – yes, mashing – no. I’ll try it again, because the flavors were wonderful. Is the cauliflower suppose to be cooked or raw? Thank you for your comments. Yes, it should be about 1 cup of chopped kale and 1 cup of chopped spinach. Let us know how it turns out. Have a wonderful thanksgiving dinner! Another question – when you say 1 bunch kale and spinach, do you mean 1 bunch of kale and 1 bunch of spinach? I don’t usually buy my spinach in a bunch. How much spinach is that? OR, do you just mean a big handful of kale and a big handful of spinach? Perhaps an actual cup-size measurement would be helpful here. THANKS. I can’t wait to make this. 2nd paragraph – add zucchini pulp to the “potatoes”??? I think you meant add to the cauliflower mash, yes?